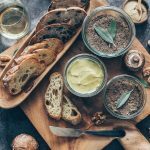 Made with two kinds of mushrooms, walnuts and sage, this pâté is rich, refined, easy to prepare and it’s vegan. It will be just the thing to serve on your holiday table that will make both vegetarians and carnivores happy. At around this time two years ago my husband and I were celebrating a return visit to one of our favorite islands, Corsica. We had been two times before but too many years had passed in between. I don’t remember now how the French island came to land at the top of our list of places to see but we’re glad we took that 40-minute ferry ride from the northern tip of Sardinia and set foot on Bonifacio, the medieval harbor town on the southern tip of Corsica, over 10 years ago. My husband, sick with the flu, drove us to Portio-Vecchio where we secured the first hotel room we could find so he could sleep for the next day and a half before continuing our Corsican adventure. Knocking the flu out of the way early on that first visit the rest of the trip was one memorable experience after another–as were the two visits after that. Corsica is French territory but has a culture distinctly different than what I’ve experienced on mainland France. Corsu, the Corsican language which is very similar to Italian, is still spoken by 35% of the island’s people today. Centuries of occupation by the Greeks, Carthaginians, Romans and Genoese along with invasions from the Vandals, Goths and Moors have all left their mark. Aside from the ritzy towns of Calvi and Porto-Vecchio, much of Corsica is rural, undeveloped, and–if you like getting lost in another culture, rustic villages, rocky cliffs, turquoise waters–it is also magical. You won’t find hundred-room hotels in Corse but with every turn on the island’s coastal roads you’ll declare each of the countless beaches you encounter the most beautiful one you’ve ever seen. 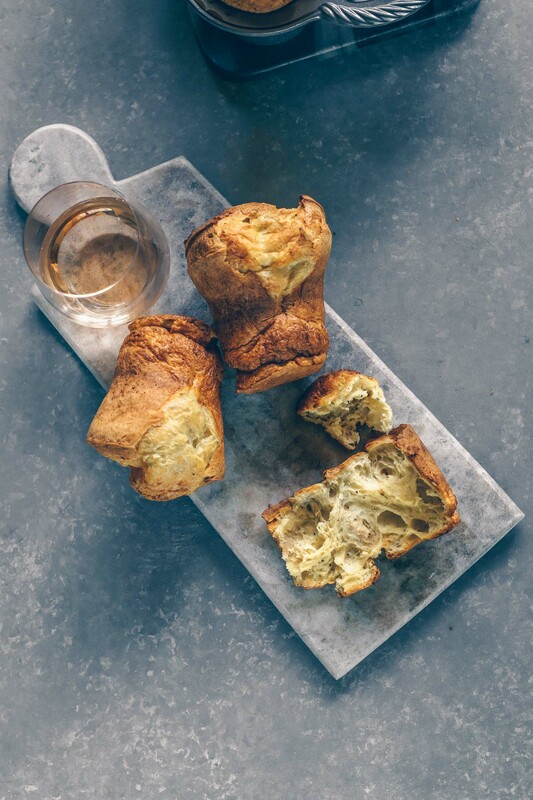 Corsican cuisine is diverse and unique, too. An island with a largely mountainous terrain, Corsican cuisine is a mix of alpine, Mediterranean, Italian and French. Wild boar reigns supreme on most menus and the markets boast every flavor pâté and terrine you can imagine. My husband returns for Corsica’s beaches but for me, the pâté is a contender for the #1 slot. 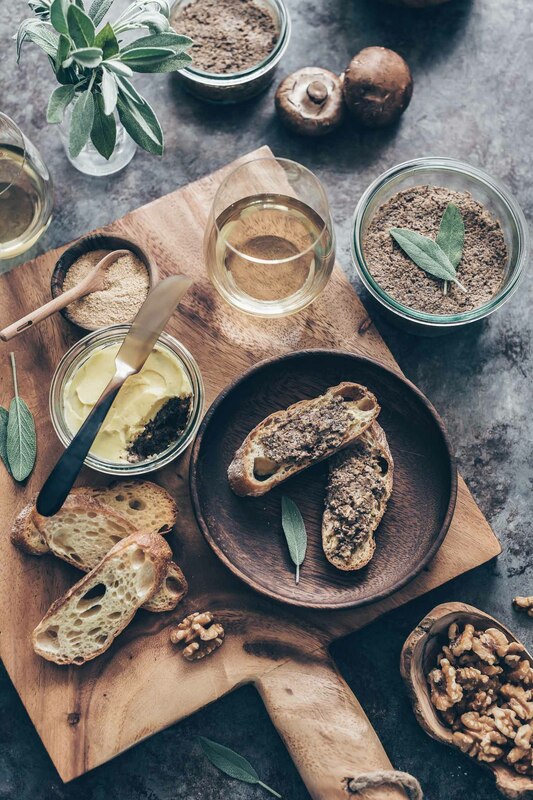 That first Corsican trip preceded the annual French Riviera trips that would become a tradition for us so really, it was in Corsica that I first set foot inside a French market…and seeing at least a dozen varieties of pâté in one place made my heart skip a beat. I couldn’t get enough. Infused with chestnuts, hazelnuts, figs, olives, oranges I had to try them all. But as much as I love liver dishes (hello foie gras and fried chicken liver), I have no interest in taking statins. Red meat and pork have always been exceptions rather than the rule in my home and recently I’ve cut back on chicken, too. And even though I occasionally share meat dishes here, most of the week we are vegetarians. This mushroom pâté came about out of my desire to create a vegan version of one of my favorite sandwiches, banh mi. An important component of classic Vietnamese banh mi is French pâté. As happy as I am that this recipe brings me one step closer to the vegan sandwich of my dreams this turned out to be much more than just a piece of something else. Mushroom pâté may be new in my kitchen but it’s been done by many others before me. I had no idea how special it could be. To be honest, this liver lover had low expectations of mushrooms being a decent substitute for the real thing but then I remembered the time I discovered shiitake bacon so I gave it a shot. I kept my recipe simple, using sage instead of the more traditional thyme since I have it growing in my garden. To bump up the flavor I added dried porcini mushrooms and some of the soaking liquid and cooked them with the fresh cremini mushrooms on low heat. Instead of cheese, I used nutritional yeast. 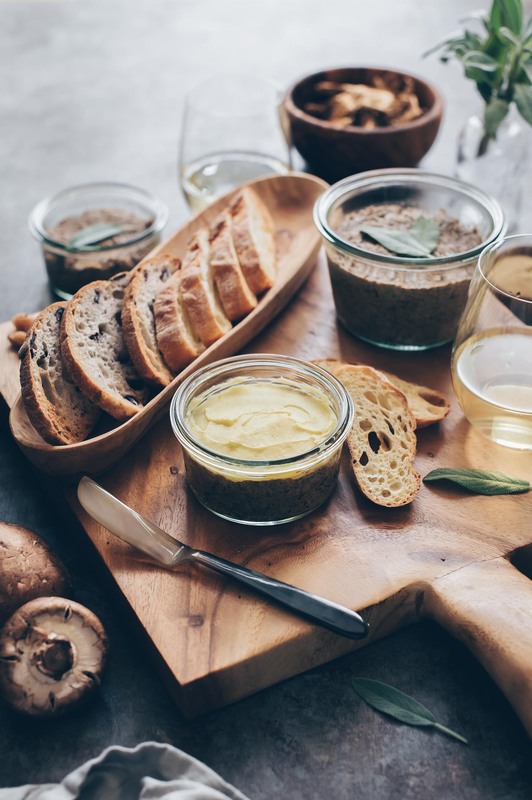 I wanted to mimic the look of traditional pâté with a layer of fat on top so I topped one of my containers with butter–just skip this step to keep it vegan. For something that took just a half hour to cook I was surprised by how well this turned out. 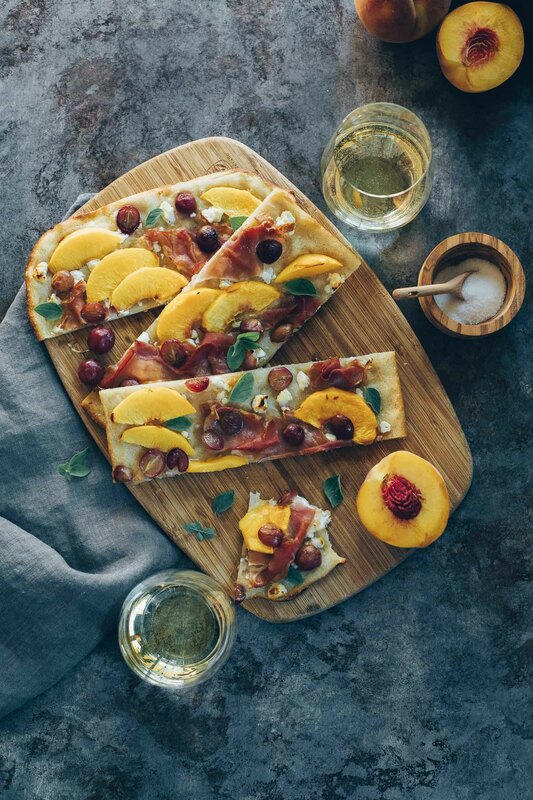 What’s more, I can see playing with this basic recipe and dressing it up with truffle oil or wine or some seasonal fruit next time. 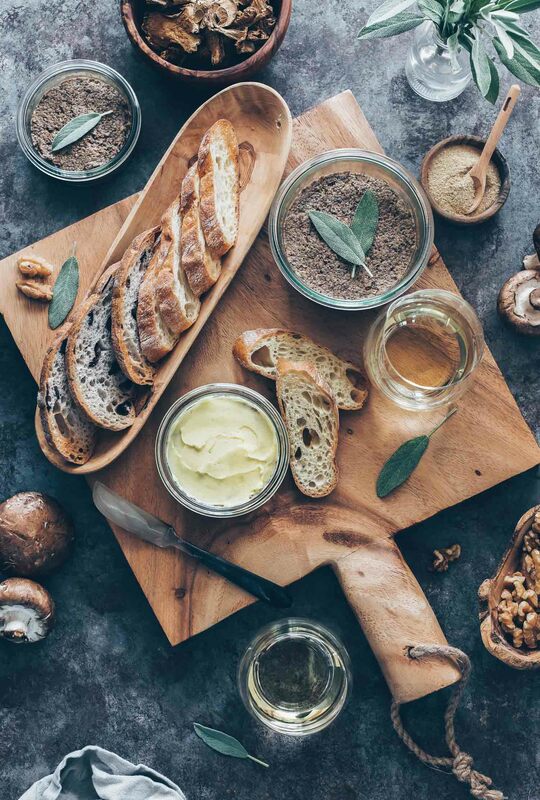 It’s definitely not just for banh mi–just like the Corsicans, this mushroom pâté has an identity all its own and I’m smitten once again. Update 2/22/19: My recipe for Vegetarian Banh Mi Recipe is here. Made with two kinds of mushrooms, walnuts and sage, this pâté is rich, refined easy to prepare and it's vegan. Perfect for the holiday table. Soak the dried porcini mushrooms in one cup boiling water for 25 minutes. Once rehydrated strain them out and chop them but make sure to reserve the liquid for later. Toast the walnuts in a dry pan over medium to medium low heat. You want a little bit of golden coloring but no burns so watch your heat. This should take no more than three to five minutes. Heat two tablespoons of olive oil in a large skillet over medium heat. Add the onion and cook for two to three minutes. Watch your heat so the onion doesn't burn. Add both the cremini mushrooms, porcini mushrooms, onion powder and a pinch or two of salt and cook over medium or medium low heat for about 10 minutes. The liquid that the mushrooms expel will evaporate during this time and you will start to see some caramelization towards the end of 10 minutes. The goal is to gain more flavor from the caramelization without burning the mushrooms so watch your heat carefully and stir frequently. Add the sage, a dash or two of black pepper and cook for another two to three minutes. Add another small pinch of salt if you feel it needs it. 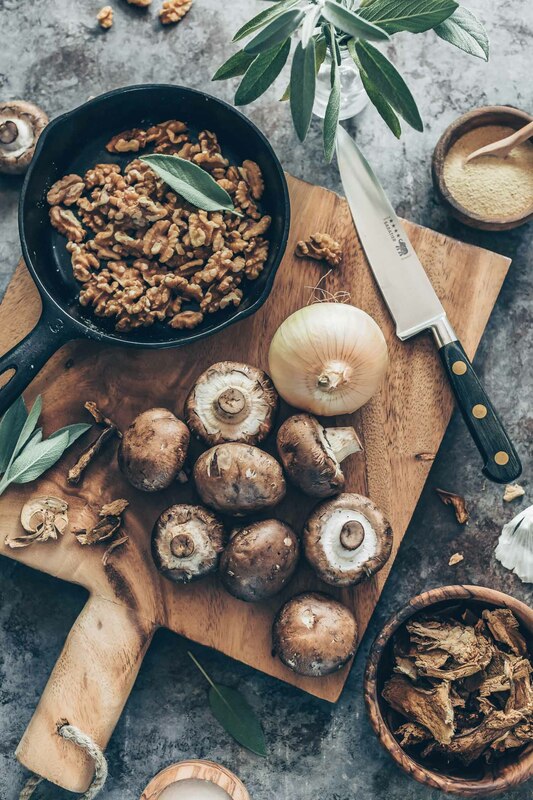 You want the mushrooms to be well-seasoned without being salty and keep in mind that when you blend the walnuts into the mixture, the seasoning will be toned down somewhat. Stir the walnuts, nutritional yeast and remaining two tablespoons olive oil into the mixture and transfer to a food processor. Add the white truffle oil if using and process until the mixture's texture is to your liking. I prefer a smooth pâté. (You can toss all of the ingredients into the food processor without stirring in the walnuts and nutritional yeast into the pan but I process in two batches). You shouldn't need to add anymore oil but if the mixture is too dry, add another tablespoon olive oil. This recipe makes two cups pâté and you can store in one large ramekin or several smaller ones like I've done. For the vegan version, omit the butter topping I've added to one of my portions (pictured). If using the butter topping just spread the softened butter on top and smooth before chilling. Pâté is best served at room temperature so remove from the refrigerator and let it sit for at least 20 minutes before serving. My favorite brand of nutritional/brewer's yeast is Lewis Labs and it's only available online. I've recently tested Bluebonnet "Super Earth Brewer's Yeast Powder" and it's what I used in this recipe with great results. It's priced better and available at Whole Foods. These two brands are unfortified, unsweetened and non-bitter. They have a good cheesy flavor. 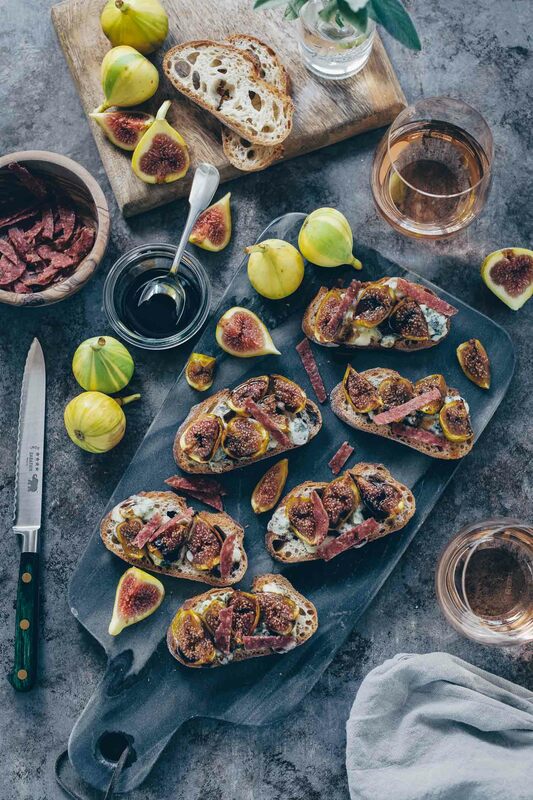 this pate sounds delicious and your photography is stunning! Can’t wait to try this! I was so intrigued by your description of Corsica, that I had to look it up even to the point of seeing what was out there on Airbnb. It’s absolutely gorgeous there. Maybe it’s in my future. But also I love this mushroom patê recipe. It looks scrumptious. Your photos are amazing and I get inspired every time I see some of them. Thanks for your posts. As far as I know Corsica is still not a top destination for Americans but it should be. It’s beautiful and rugged and the beaches! So appreciate your very generous compliment, Kristy. Thank you so much!! 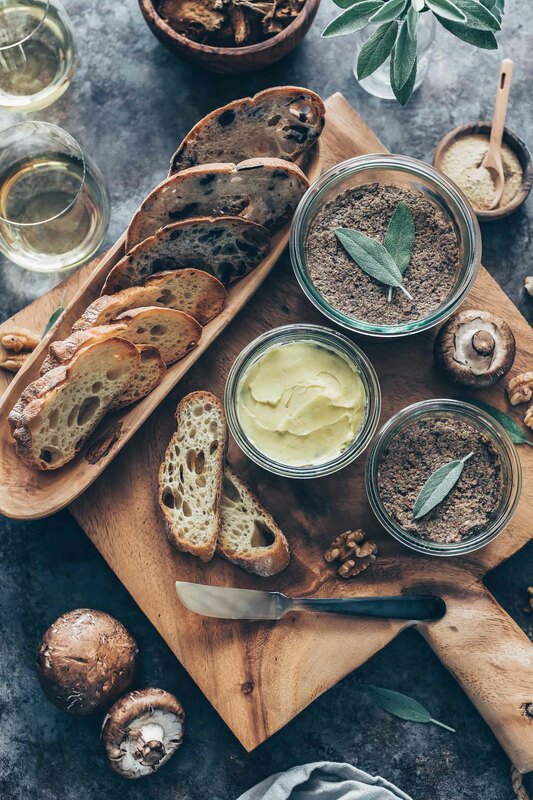 I can’t wait to get to the French Riviera and this mushroom pâté looks so perfect for holiday entertaining! I want to make this for Thanksgiving. Do you think it can be frozen for a few weeks? Or should I make it the day before. Thanks. I’m excited! Hi, Mimi. I haven’t tested this in the freezer so I’m not sure how well it would keep. I’d recommend making it two days before. The flavors kept for several days so this should be no problem. Hope you like it! !